Inadequate skill in performing surgical tasks can lead to medical errors and cause avoidable injury or death to the patients. On the other hand, there are situations where a novice surgeon or resident does not have access to an expert while performing a task. 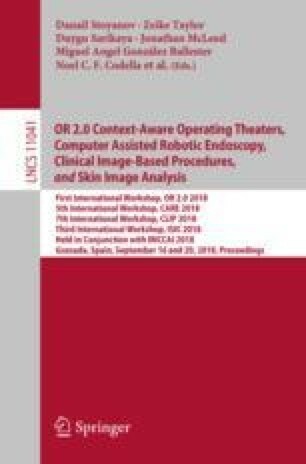 We therefore propose an interactive ecosystem for both training and practice of surgical tasks in mixed reality, which consists of authoring of the desired surgical task, immersive training and practice, assessment of the trainee, and remote coaching and analysis. This information-based ecosystem will also provide the data to train machine learning algorithms. Our interactive ecosystem involves a head-mounted display (HMD) application that can provide feedback as well as audiovisual assistance for training and live clinical performance of the task. In addition, the remote monitoring station provides the expert with a real-time view of the scene from the user’s perspective and enables guidance by providing annotation directly on the user’s scene. We use bedside ventriculostomy, a neurosurgical procedure, as our illustrative use case; however the modular design of the system makes it expandable to other procedures. We thank Professor Russell Taylor for his guidance and Patrick Myers, Benjamin Pikus, Prateek Bhatnagar and Allan Wang for their assistance with the software development.